We see more of the world outside of Daevabad, giving the author the opportunity to flesh out the setting. Characters really are great. Nahri is really forced to manipulate everyone using her con-artist skills to thrive in brutal Daevabad. Ali has to start playing the game of politics despite his pious disregard for tricks and betrayal. And Mutadir becomes a fully fleshed out person. Stronger plot than the first. In the first book Nahri didn’t have much agency. In this book she takes the reigns of the plot by force and commands where the story is going. finally Nahri is the leader of the Persian daeva. The pacing is by and large solid. The author didn’t have the slow start which book 1 had, which is a good thing. We knew too much about the climax of the plot in advance. To use a ‘Dune’ reference, we knew about the doctor’s turncoat status well in advance and that spoiled the fun somewhat. I wanted to be surprised when the ‘event’ finally happened at the end of the book, but I really wasn’t. Some foreshadowing is a good thing, but too much isn’t. We got to see more the world outside of Daevabad, which is a good thing. However I wanted to get more than what we got. Only about 30% of the book is spent outside of Daevabad. To put this in perspective, this is a setting filled with djinn and marid and peri and ifriti, but we’re stuck in a the same city as the first book filled with only djinn. If we spent more time abroad we could have seen more. The plot of this novel is much more holistic compared with that of the first. Nahri spends the entirety of this story in Daevabad, she gets to have a fully fleshed out plotline. She is fully in control of her life, whereas in the first book she lacked any agency at all. Without going into too many details, Nahri is a healer and wants to build a hospital for the poor half-humans/half-djinn of Daevabad (they are called shafit). No one besides her wants this, (including both Nahri’s Daeva priesthood and the shafit themselves) but she manages to twist enough arms to get it to happen. In the mean time Ali, has been banished from Daevabad due to his ‘corruption’ by the water marid. He returns to his Geziri homeland in Arabia, where he tries to fix all the problems his cousins are having. I really liked this phase of the story… up until Ali is forced to return to Daevabad. Now I liked his Daevabad plot-arc, but I think the series as a whole needs more time outside of Daevabad. Daevabad is cool and all, but this is just one city. There’s a reason why so many of the Discworld City Watch books involve the City Watch leaving the City. And finally Dara the Afshin. After his death in the previous novel, he was brought back to life by Nahri’s mother Manizheh, the woman everyone has thought was dead for years. Together they, along with various ifrit and other undesirables, are plotting revenge against the Geziri who have taken over Devabad. I liked this plotline, even though I wished the author played her cards closer to her chest going into the climax of the story. The characters here were a step up from the first book in the series. Nahri has settled into her life in Daevabad, and basically resigned herself to a loveless marriage with Mutadir. Mutadir is equally resigned to life with her, separated from his true love the son of the Grand Vizier. The pair of them have a mostly working relationship, where neither one will go out of their way to undermine the other and in return the other will do the same. While they aren’t enemies of one another, their semi-antagonistic relationship with one another leads to a lot of passive-aggressive resentment. This resentment goes a lot way to fleshing out both characters and making them seem real. Nahri’s love triangle with Ali, Mutadir’s brother, is in a ‘will they/won’t they’ sort of phase. I really like how their relationship is turning out, because I really have no clue where this is going. Nahri has a ton of reasons not to trust Ali, with the reverse also being true, but they still have great chemistry despite their divided loyalties. I’m wondering if the author will kill/divorce Nahri and Mutadir so they can get together. And for that matter I’m not even sure Nahri and Ali realize that they’re in love with one another. One way or another there’s going to be fireworks in the final book in the series. Ali didn’t receive much character development in this novel. He had more agency in this novel than the first, but that agency only took place in the final moments of the novel. While he is staying true to the character depicted in the first novel, he hasn’t changed one bit despite all the events of two whole traumatic books. I want more from him in book three. And finally Dara. I like where the author is going with him. He’s not jumping into the abyss of evil, but slowly making unethical choices, guided by the subtly malevolent advice of Nahri’s mother Manizheh. Authors too often turn bad guys into maniacally evil monsters. I hope the author maintains this slow descent into well-intentioned extremism with Dara. The book’s pacing is alright for the most part. It has some slow bits and some fast bits, with neither pole overstaying it’s welcome. It doesn’t have the slow start of the first book, but it also doesn’t have the same moments of absolute enthralling pique present in the first book. Net total I call it good. Style wise, this book reminded me quite a bit of some of Bradley Beaulieu’s and George R.R. 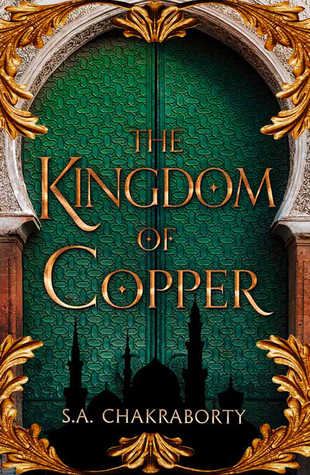 Martin’s work, namely a politics heavy trilogy set in a Middle Eastern setting. However instead of human characters with little/no magic, the characters are all djinn and they all have magic. This plays it’s politics tropes straight, and to good effect. I the reader was left clueless as to how the book would actually end, because the different factions were hatching various plans and conspiracies which were mutually exclusive. When all the conspiracies went off at the end of the book, chaos ensued in a totally satisfying way. I’m not going to spoil it because it’s worth reading what happened. Furthermore, I liked how the climax really upped-the-ante of the series, and forces book 3 to go in an entirely new direction. I liked the villainous shafit terrorist faction in the first book. They seemed to have mostly dropped off the map in this novel. They added a good bit of morally grey to the story which this book was by and large missing. And because they were missing, when the Geziri or the Daeva did evil oppressive stuff to the shafit, their oppression it really didn’t seem semi-justified like it did in the first book because in the first book the shafit were very frequently visibly fighting back. I wanted to see more of the world outside of Daevabad. Only about a third of the story takes place outside of the city, and that wasn’t enough. This setting is cool, it’s a shame we’re stuck in one tiny city for this entire novel. Net total, I’m going to be reading the next book in the series day 1.